We’re often asked “When is the best time to visit Orlando?” The truth is, there’s really no wrong answer, and it depends on your preference. Some people prefer to visit during the quieter months, when there’s lower wait times and fewer crowds. For others, there’s something to enjoy with the buzz of a busy theme park, so they prefer to come during high season. Below we’ve broken down different times of year according to weather, crowds, prices and popular events so you can decide for yourself on the best time to visit Orlando! Crowds: For those of us who hate crowds, the winter and early spring mark a nice lull in Orlando tourism. If you’re hoping to avoid lines, now is the time to go. Weather: The weather is great, and you’ll find temperatures during the day in the mid-70s with dips to the 50s at night. Bring a light jacket though, because on rare occasions it can hit as low as the 50s and 40s during the day. Florida is also known for the occasional afternoon shower, but from January to April you’ll find far less than during the summer months. Prices: Although you won’t find the lowest prices of the year during this time frame, you can find discounted rates until around late April. The only exception is really is a spike in rates around mid-march which goes along with Spring Break. Vacation rentals can be found for as little as $71 a night in late January and early to mid-April. 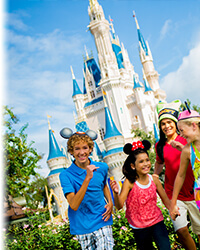 Crowds: Although its can be hot and Central Florida gets a little more rain than usual this time of year, school schedules pretty much mandate that (for families with children at least) this is the most popular time to visit. If you’re looking to avoid crowds, we recommend coming in the early winter or spring months. Weather: It’s hot. There’s really no other way to put it. Highs are routinely in the low 90s and afternoon showers are frequent. That said, the showers are often over in less than 20 minutes and the weather is actually enjoyable if you dress appropriately, wear sunscreen and bring a pair of good sunglasses. Prices: You would expect prices to be highest this time of year since school’s out for summer (yes, I sang that in my head too), and they can be, but that’s not to say you can’t still find good deals if you go at the right time. Vacation rentals with multiple bedrooms can be found for as little as $71 a night in May and early June. Crowds: This is one of the prime times to come visit Orlando if you come during the early winter months. By December though, families normally pour in on their winter holiday excursions to Florida. 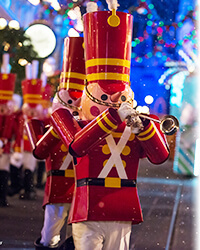 Christmas time is especially popular across the Walt Disney World parks. Weather: The weather this time of year is great. Highs range from the upper 80s in Septemer to the low 70s in December, with the lows bottoming out in the low 50s is December as well. Shorts and t-shirts are usually all that’s required, but pack a light jacket for colder than normal days. Rain is much less frequent starting in November. Prices: Bargain hunters, take note. If you’re looking to get the best possible deal on a vacation rental or hotel, now is the time you want to come to Orlando. During all of September and nearly all of December, you can find rock bottom rates on Orlando vacation homes. October and November are a little more expensive, and Christmas and New Years of course have some of the most expensive rates of the year, but if your choose the right winter month to come to Orlando, there are deals to be had. All in all, deciding on the best time to visit Orlando is tough. Every season offers a compelling reason to come. If we really had to choose though, our recommendation would be sometimes between January and April if you can get the kids out of school. The crowds are minimal, the weather isn’t too hot or too cold, and if you come at that right time, you can snag a fantastic deal.